One of the most common household repairs involves leaky faucets. Not only can these be a major annoyance, but expensive as well. Learning how to repair that leaky faucet yourself can eliminate costs associated with hiring a plumber and waiting for help to arrive. Follows are some simple steps that anyone can use to troubleshoot and fix the problem. 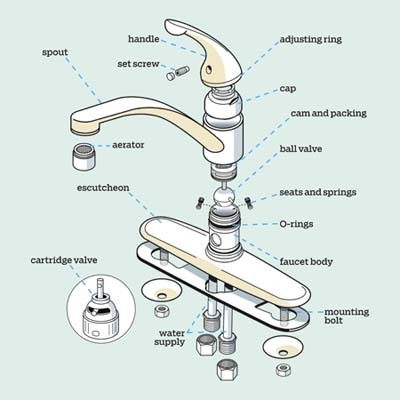 First, get acquainted with all of the parts that make up the faucet. Understanding what components are involved and the proper tools to use is half the battle. Use a diagram that lists each component of the leaky faucet. This is an excellent resource to keep handy in just such situations. Commonly a leaky faucet is due to the aerator. This is the little mesh screen located within the head of the faucet. If clogged, use some vinegar to remove deposits. Clean out any blockages. If torn, replace the screen to resolve the issue. If the handle is difficult to use and turn, this may cause the faucet to leak. Adjust the screws that hold the leaky faucet in place. Examine any rings between the handle and the fixture to eliminate any sticking problems. The faucet is attached to the sink via a part known as the escutcheon. If this area because loose or water gets between the faucet and sink base, the caulk may need to be replaced. Also, check the bolts used to mount the escutcheon to the deck. Typically any type of leaky faucet drip is an indication that there is a problem with the ball-value assembly. This could be as simple as replacing an O-ring, spring or seat, or it may require swapping out the entire assembly. If it problem is in the actual assembly, a professional plumber may still not be required. Try holding the ball value against the seals. If it leaks at the faucet opening, replace the assembly. If the problem is where the faucet attaches to the pipes, it is best to stop and seek additional help. Water temperature or lack of flow problems with the faucet may mean that the components within the assembly are coated with deposits of various minerals found in the water supply. Soaking these dirty parts in vinegar is an optimal way to remove any buildup. Examine the ball valve itself. 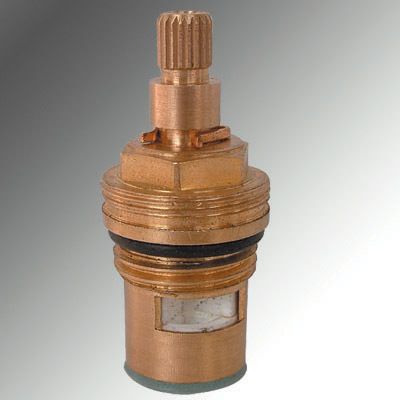 If, holding the value in place, and the faucet sill leaks, replace the springs and seats for the ball valve. If the leaky faucet is due to worn or older O-rings, apply plumber’s grease to the area to help eliminate any drips. Swap out older O-rings with new components can fix the problem. 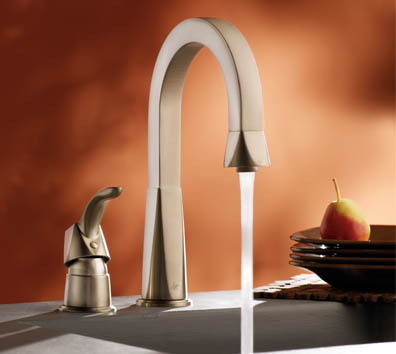 Newer faucets have a component known as a cartridge value. Replacing this can eliminate any leaks that occur in the faucet spout. If the leak is within the handle, change out any O-rings or seals in the cartridge value. Use these simple steps to lower home maintenance cost. If these tips don’t result in a solution in how to repair that leaky faucet, it is best to call someone with experience. Home plumbing repair without the necessary knowledge can result in more damage and a costly repair bill from a professional plumber. It is really nice that you have shared the tips to fix a leaking tap. Many people and take help from it. Nice information, thanks for good the informative topic. Knowing what it really takes will help you make a more informed decision about how to get your drains cleaned. Here are the things that it really takes to repair that leaky faucet for any home. Thanks for sharing a information.